For once, you can take the “@” symbol at the front of a Twitter account name literally. 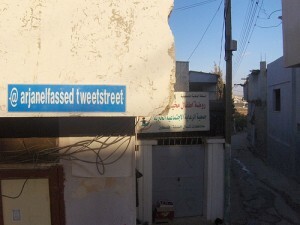 The Twitter name “@arjanelfassed” is not only the Twitter account of one Arjan El Fassed; it’s also the name of an actual location, “@ arjanelfassed tweetstreet,” which is now a street in a Palestinian refuge camp. The Dutch website Jouw Eigen Straatnam charges $146 for each of 200 street names in the Askar camp and gives the proceeds to the Palestinian Child Care Society (PCCS), according to Al Fassed, to fund “cultural and expressive after-school activities” for the up to 1,000 children in the camp at its youth center. Part of the program’s allure, he says, is that the corresponding street signs are temporary. There aren’t many places in the world where you can buy a street name, which leads us to believe that this claim that his is the first street named after a Twitter account is accurate. Has anyone seen another?